My kids have recently discovered they like persimmons! Hooray! When I asked my six-year-old what dessert we should bring to his First Grade potluck last week, he said it should be something with persimmons and chocolate. Okay! 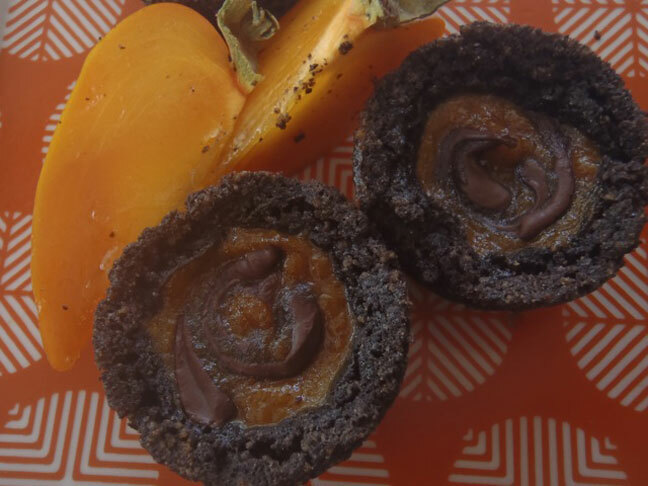 These tarts are made with Hachiya persimmons, which must be used when they're extremely ripe. They will be incredibly soft with a silky, smooth pulp inside — perfect for baking. 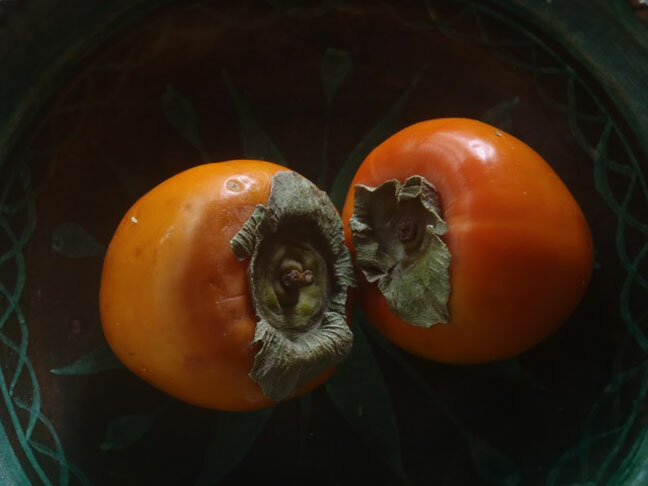 Persimmons will always remind me of growing up with my best friend Aimee, because her mom was always sure to have a bowl of persimmons on the kitchen counter every November and December. I love foods that bring back wonderful memories, and even more, I love creating those great food memories for my boys. Preheat the oven to 350 degrees and set aside either 4 non-stick mini muffin pans, 2 non-stick regular-sized muffin pans, or one pie plate. To make the crust: finely grind the Oreos in a food processor until they're smooth. Pour them into a large mixing bowl and fold in the melted butter. Gently press this mixture into the muffin pans or pie plate to evenly coat the bottom and sides. Bake the crust in the preheated oven for eight minutes. When you remove the crusts from the oven, they might lose their shape a bit. If this happens, just use the back of a teaspoon to re-form them, gently pressing the center. Let the crust cool in the muffin pans or pie plate, set aside, and keep the oven on. To make the filling: in a medium-sized mixing bowl, combine the persimmon pulp with the sugar, honey, vanilla, spices, and salt. In a tiny bowl, use a teaspoon to blend the cornstarch with the milk (this is called a slurry). Once it's smooth, add it, along with the eggs. Mix until combined. 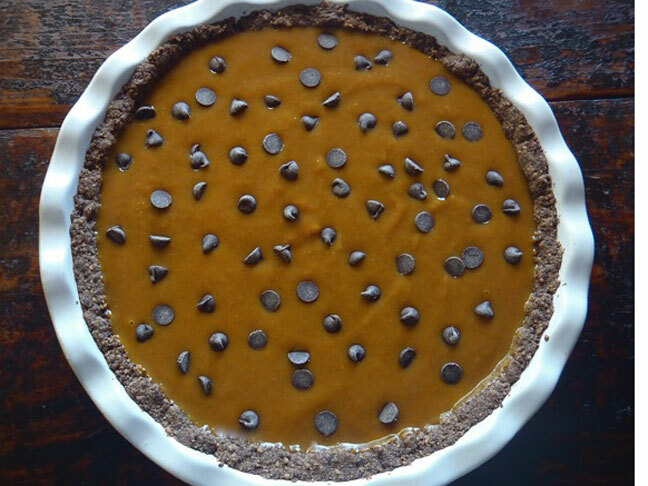 Fill the cooled crust with the persimmon mixture, almost to the top. 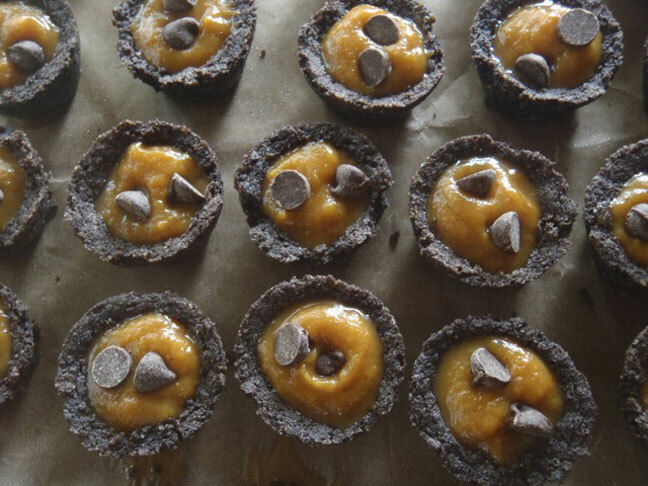 Then place chocolate chips on top — 2 each if you're using mini muffin pans, about 5 each for the regular-sized muffin pans, and all of them spread out evenly for the pie plate. Place the muffin pans or pie plate in the oven and bake for 5 minutes. Then use the tip of a chopstick or a toothpick to "swirl in" the melting chips. Return the pans to the oven and bake until solid, about 10 minutes for the mini-muffin pan, about 15 for the regular-sized muffin pans, or about 25 for the pie plate. For a gluten-free version, Glutino and Kinnikinnick both make great Oreo-like cookies. They're available at Whole Foods. You can replace the persimmon with pumpkin when they're not in season. 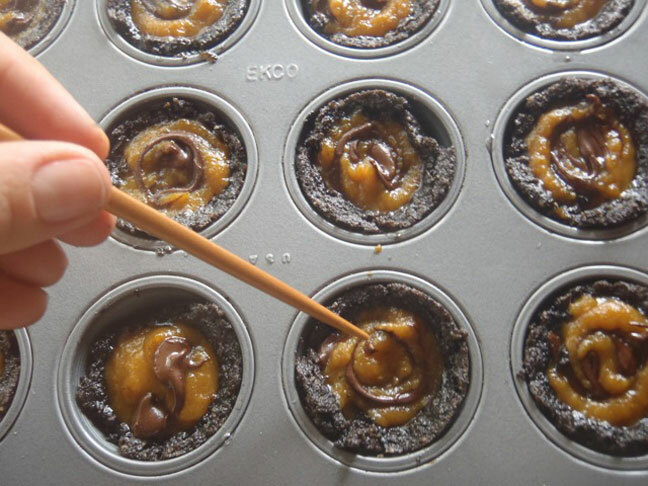 I love using the mini muffin pans (because they're so cute), however I'm giving the other options, as each size up will take less time to prepare — and any way you choose, the result will be delicious!